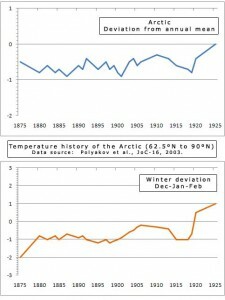 What caused the Arctic Warming? What does not explain the warming? This variability appears to originate in the North Atlantic and is likely to be induced by slow changes in the oceanic thermohaline circulation. However, SAT records demonstrate stronger multi-decadal variability in the polar region than at lower latitudes. This may suggest that the origin of the variability may lie in the complex interactions between the Arctic and the North Atlantic. Already back in 1938 C.E.P. 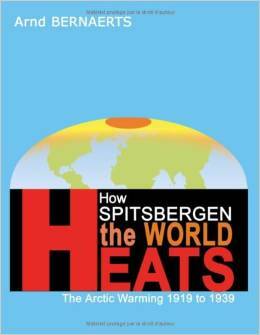 Brooksexpressed his disagreement with regard to R. Scherhag’s assert, made in 1936, that an increase of atmospheric circulation was the cause of Spitsbergen’s warming, as one should still have to account for the causation of change in circulation. Why is this question not answered yet, although Brooks had made the right point already 70 years ago? Although Polyakov et al. take a closer look at ocean matters it seems that they have missed a interesting point, when assuming that the variability might have been induced “by slow changes in oceanic thermohaline circulation”. This notion neglects completely the fact that there must have been a very sudden and dramatic change in the oceanic interior. The previous analysis demonstrates this fact beyond any doubt. Obviously, the ‘big warming’ from the winter of 1918/19 could have been caused only by a extremely rapid change, so quickly that it has never been observed since weather and ocean records have begun to be registered, 200 years ago. The statement sustaining that the “variability appears to originate in the North Atlantic” is not very enlightening as well, because the location where the “variability appeared” can be very precisely identified as being the island of Spitsbergen. It is also difficult to agree with Polyakov et al affirmation that the “variability may lie in the complex interactions between the Arctic and the North Atlantic”. The problem derives particularly from the word “interactions” because the overriding relation between the two oceans is the one-way transport of warm water to the Arctic basin. The West Spitsbergen Current transports warm Atlantic waters to north, through the Fram Strait into the Arctic Ocean, and, in the opposite direction, the East Greenland Current transports very cold fresh water and sea ice southwards. The features of the two currents are so different that one can consider them, in the widest sense, as separate entities. While they run in opposite directions, there are inevitable and considerable mixing and interactions going on. But these mixing and interactions cannot be held responsible for the generation of such an extraordinary warming up event. Actually, the higher any interaction at the time period in question, the less significant would have been the warming up of Spitsbergen. Interactions between different currents of the North Atlantic can be excluded. Of the two most prominent currents in the high North Atlantic, one is flowing from South to North (off Norway’s coast) and from North to South (off Greenland’s coast) are separated by a distance of 1000 km. There is no claim sustaining that any significant warming, or cooling, or any other relevant change in weather statistics had been observed in the North Atlantic, in the south of the Polar Circle (66˚ 34′ N), in the winter of 1918/19. Finally, it should be stressed that the sudden warming phenomenon was definitely not generated in the sea areas from the N-West, North and N-East of Spitsbergen (80˚ N) for the simple reason that they had been permanently covered in sea ice. In winter, the cover could reach 70-100%, in summer, with great variations, around 50%. The sea ice ‘shield’ reduces to minimum all interaction between sea and air. Ice-covered seawater releases 90% less heat into the atmosphere than the open sea. Over a longer period of time it is possible that winter temperatures in the ice-covered areas could have increased very slowly, but any assumption that such areas could have played a significant role in a dramatic temperature rise of the magnitude of Spitsbergen’s, is completely unfounded. All areas situated North of 80˚ N and South of 66.5˚N are excluded from the list of possible contributing factors. East Greenland Current is very cold and the Barents Sea depended completely on warm water supply from the South. 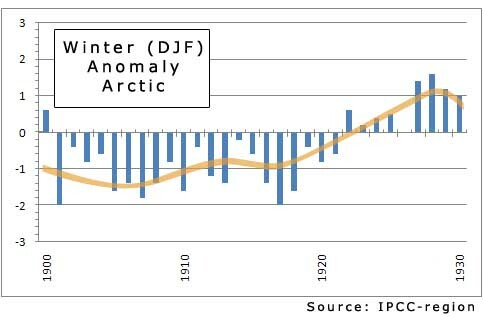 Consequently, it is not difficult to confine the forcing of the Arctic warming since the winter of 1918/19 to a spot in the North Atlantic, namely Spitsbergen. 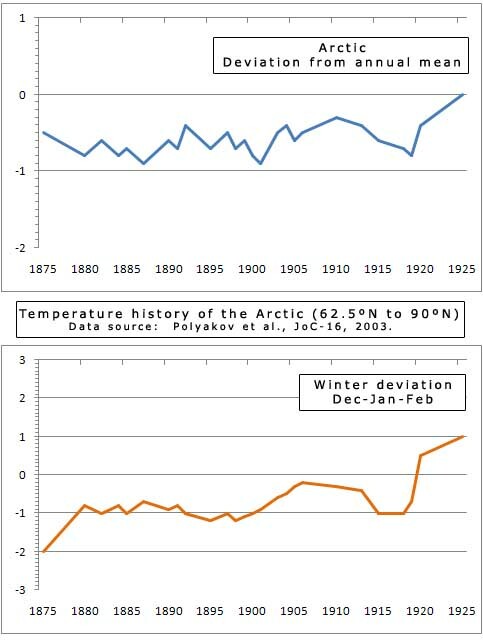 Igor V. Polyakov, Roman V. Bekryaev, Genrikh V. Alekseev, Uma Bhatt, Roger L. Colony , Mark A. Johnson, Alexander P. Makshtas, and David Walsh; Variability and trends of air temperature and pressure in the maritime Arctic, 1875 – 2000; 2003; Journal of Climate, Vol. 16, p. 2067-2077, 2003 (p.2072). Zakharov, V.F. ; 1997, ‘Sea Ice in the Climate System’, Arctic Climate System Study, WMO/TD-No. 782, p. 70. Brooks, C.E.P; ‘The Warming Artic’, in: The Meteorological Magazine, Vol. 73, March 1938, pp. 29-31.